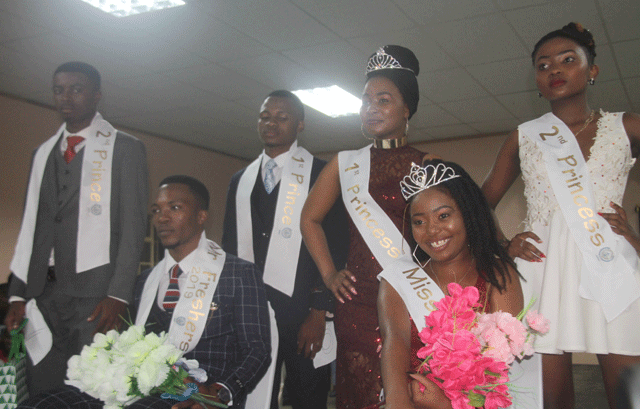 WHAT was meant to be a night of catwalk and crowning of the fairest on Friday at Tum’s Waterworld turned into a political protest by the Southern Africa Nazarene University (SANU) students led by their SRC president. The students chanted political songs. SRC President Tholumuzi Gubevu took to the stage and screamed loudly on the mic ‘Amandla,’ much to the cheering of the students delivering his speech in true ’s Julius Malema style. He asked the students to fight for reinstatement of their suspended colleague. “Comrades let’s fight and work, towards bringing one of our fall heros back to class. He was unfairly suspended,” said Gubevu as the students erupted into struggle songs and chants. The 20 contestants made their way to the stage clad in gym wear. In a rather odd manner, the contestants did not introduce themselves or even say their names. They were only identified by numbers pinned on their waists. The contestants were also dressed by an upcoming label wear called ‘Destiny’. The last category of the competition was the evening wear where the judges; model Snowee Simelane, Mr Eswatini Director Linda Chester and Celiwe Magongo picked the top five. The MC and the organising team were in a standoff for 20 minutes with the students begging them to lower their voices for the question and answer session. The students would hear none of the pleas. The judges then decided to skip the Q and A session and went straight to crowning the deserving winners. The eventual Mr and Miss SANU Freshers were Mcebo Mthethwa and Nolwazi Dlamini, respectively. The queen and king said they were shocked and elated by their win as they did not expect it. But mostly, they were humbled by the whole experience.